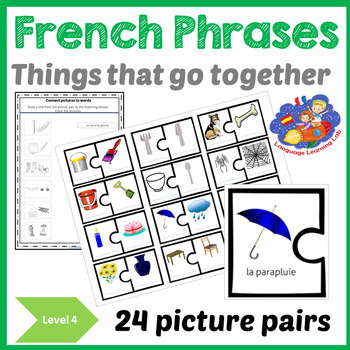 French resource, to learn 'Things that go together', enabling children to expand vocabulary, learn word associations and express semantic links in phrases. ✔ 24 picture pairs and jigsaw puzzles e.g. fork and knife. ✔ Checklist to monitor progress. Please see the PREVIEW for more information! My YouTube channel called French@LanguageLearningLab has songs, stories and vocabulary videos to support children learning French as a second language. Please leave feedback and follow my store!